"Magpie heads back upwind as the fleet comes down to the windward gate during the 2018 Australian Championship off Fremantle"
Team Magpie set about being at the top of the Etchells Class just over four years ago now. In that time, we have taken out a few State titles, the Australasian Championship, been runners up at the Worlds, and for the last three years, the Australian Champions, as well. Yet the goal has always been a World title, and with Brisbane Fleet playing host for 2018, we are truly committed to going one better. Before that, we plan to become back-to-back champions at Mooloolaba. In between that, and Brisbane in October, we will do one regatta in the USA or UK, as well as continue our solid training regime over the Winter. The primary attribute required with sailing is to stay focussed on your job. It really is the secret to good execution. Many things have moved on from when I was campaigning for the Olympics in the Soling, and also won the Etchells World Championship back in 1999. Not the least of which are us, for the body does require different treatment now. Not only is about hard work out on the water, but also in the gym, or on the road with bike, as Steve Jarvin is so fond of doing. He cycles every day to stay on top, and is still very strong. Perhaps he gains extra motivation from having to compete against his own son these days! We have each raised the bar in regards to our own preparation to account for the passage of time. Having a routine is very important, and this extends to everything. For example, I do our food. Lunches are a big factor. We have chicken and beef, not sandwiches, and for the Worlds, we got a chef, so that we were properly fed, and watered (the H2O variety only), and then off to sleep. The hardest thing now is to keep the body going. We have physiotherapy, or a massage whenever we can, just so we can keep the body as close as to Day One, when we’re racing on Day Seven! Part of this is also about having the base, where I can get an ice bath, eat the right food, and get into a nice bed. I can assure you I am completely spent for 10 days after each and every regatta now. To ensure we can maintain the programme, we do strength and conditioning up to three times a week, and sometimes more. So if that is the preparation and maintenance of the sailors, then it is Richie Allanson who looks after the boat in collaboration with us. He’s the one who puts the wheels on the spinnaker halyard, services the cam cleats, tweaks the layout, so as to make it all the more smoother, and allow us to execute our manoeuvres better. Of course, Richie is often on board for regattas when Steve cannot make it. For the last 12 months we have also had the fortune to have Jeanne-Claude Strong, Seve Jarvin, Marcus Burke and Tiana Wittey as our training partners. A great benefit is also having Nev Wittey’s insights as JC’s coach, at which he performs superbly. 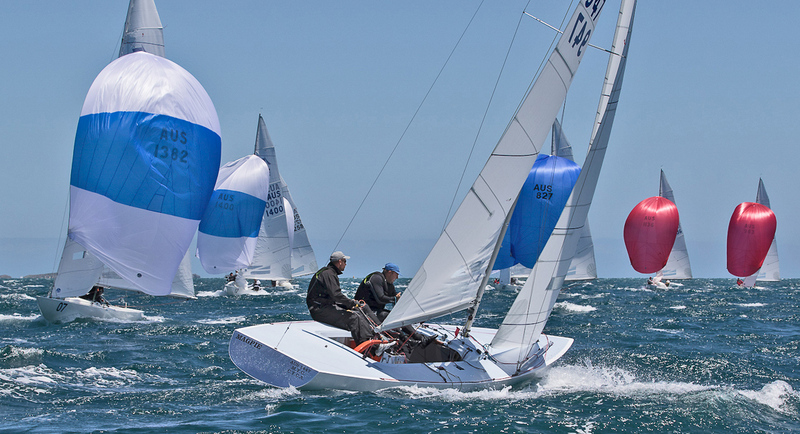 Iain Murray is another person we benefit from sailing against, and with his new boat, he is sure to offer even more drive and intensity into the whole equation, based on his current results. The next element is our combined experience, and this aids in us being very consistent. It is about the planning, preparation, dedication and the skills required to drive a team forward. Out on the water we are a team, and understand that everyone brings different aspects. Once back ashore we relax, have a short debrief and then time off. Remember at this point that the acronym, TEAM, means ‘Together Everyone Achieves More’. We are a very quiet boat, and all activities are considered and deliberated before execution. I focus on our tactics downhill, Graeme Taylor is an incredible helmer, and he is so confident with his boat on boat stuff. ‘GT’ is also marvellous at supporting us, and really making us think with all the decisions we make. It is simply wonderful to watch. Steve Jarvin is an incredible tactician uphill, with unbelievable recall on all conditions and how it should be set up. Richie is a craftsman, and his knowledge of sails from all those years with North Sails comes to the fore out on the water. 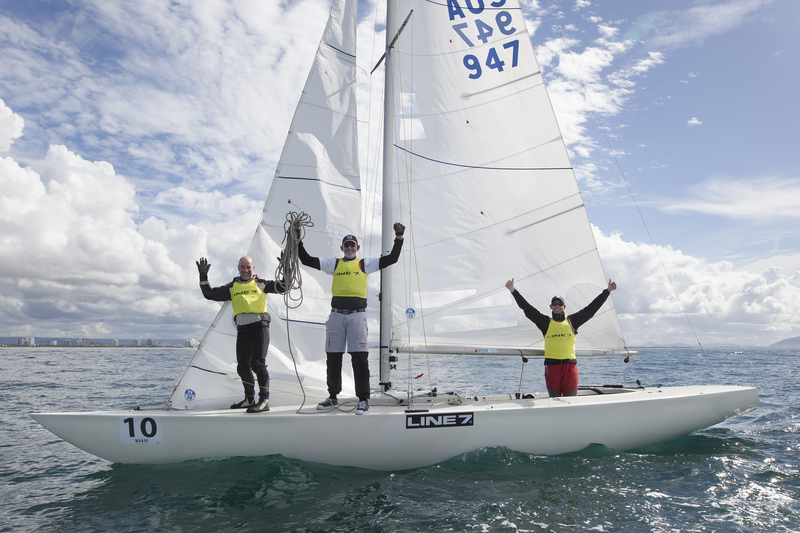 "James Mayo, Steve Jarvin and Graeme Taylor win the 2017 Australasian Championship"